Evensville, TN — Rhea County High School basketball took time to honor seniors between games against White County on the last regular season game of the season. In the opening game, the Lady Eagles gained measure of revenge with win against White County to keep hopes of third place finish alive. The Lady Eagles won behind 23 points from Haley Cameron. After slow 2-7 start the Lady Eagles outscored the Lady Warriors 13-6 to take 15-13 lead after one quarter with Haley Cameron netting two threes to lead the way. Cameron and Macy Welch each netted two threes in second quarter as Lady Eagles pushed the halftime lead to 30-19. In the third quarter, Mia Murray and Kendreah each scored eight points but Haley Cameron hit for a trio of long range shots on her way to eleven points as Lady Eagles won quarter 23-20. Rhea finished strong with lots of time for reserves and got the 71-44 win. 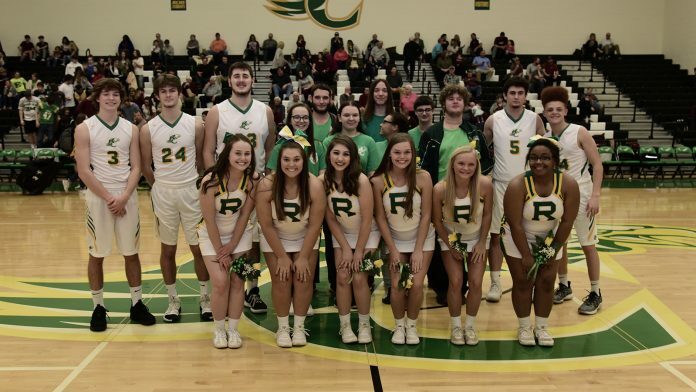 Rhea saw their chances of third place finish fall when Stone won at Cookeville and now are looking at play-in game in district tournament on Tuesday, February 12th against Warren County. Mallory Hampton(19) and Maddie Taylor(10) joined Cameron(23) in double figures for the Lady Eagles. Also scoring: Macy Welch(8), Kaitlyn Taylor(6), Skylar Jenkins(3), Maddie Smith(2) and Shelby Davis(1). The Eagles looked up at wrong end of 23-15 score despite 10 points from Kaleb Laws. Ricky Guthrie led Eagles in second quarter with 8 points as Eagles cut the lead to 7 at 33-26. In the third quarter White County pushed the lead to 53-38 on their way to the 77-61 win. White County hit 10 three point baskets to only 2 for the Eagles. Kaleb Laws added 20 rebounds to his 20 points to led Rhea County. Also scoring were: Hunter Hill(15), Ricky Guthrie(13), Cameron Thunquist(5), Dylan Palermino(3) and Drake Taylor(2). The Eagles will travel to Stone Memorial for play-in game for district tournament with late game against Warren County, a team they have already played three times this year. A win will put the Eagles into the region tournament. For the Eagles, five players played their last regular season game for the Eagles. Those included Drake Taylor, Dylan Palermino, Kaleb Laws, Jackson Harveston and Cameron Thunquist. The Lady Eagles had no seniors in this year’s class. Caitlyn Farnsworth, Maycee Henry, Hannah Masterson, Alexis Burton SeAira Banks, and Madison Carter .